News flash: Revolva teaches “Multiple Hoop Mayhem” in the Detroit area (Southfield), Tuesday, Aug 12 at Northwest Unitarian Universalist. Revolva was “made in Detroit,” so she’s excited to be able to teach a workshop on her summer travels back to the Midwest. See registration info below to add some hoops to your flow! Revolva’s multiples class, Portland, OR, 2013. Tuesday, Aug. 12 * 6:30-8 p.m. In this workshop, we’ll begin by exploring multiple hoops on the arms and in the hands. We’ll then move on to the core. 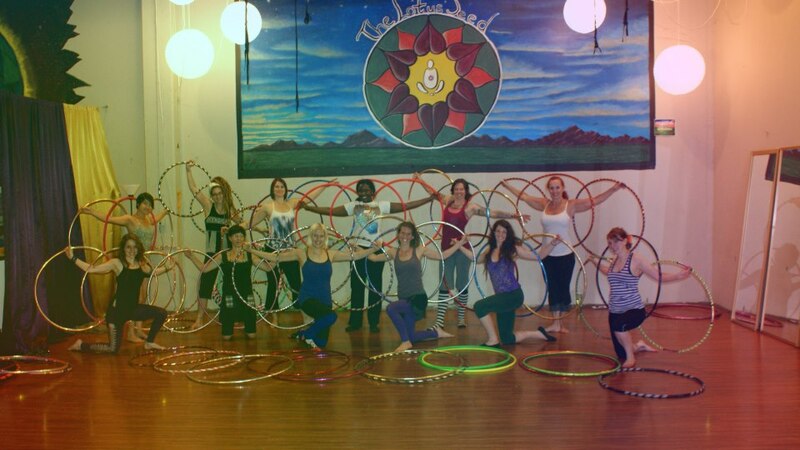 Using two, three, four and more hoops, we will create patterns inspired by modern hoop dance, as well as Native American and circus-style hooping. Increasing the amount of hoops you work with engages new and exciting parts of the brain, as well as several exciting muscles. Revolva has taught “Multiple Hoop Mayhem” across the U.S., in the U.K.—just never yet in Detroit. Don’t miss out! Please try to bring 4 same size hoops to this class. Revolva will have some extra, but not enough sets for an entire class. In the worst case scenario, we will share and take turns.